When I arrived in Agua Salada, Honduras, I went for a hike and came across Maria one of the midwives and a community figurehead walking slowly up the trail to her home. I spoke with her in Spanish for a few moments before she asked me to help her return to her home. A few minutes later we climbed the rocky steps and arrived at the entryway into her property. The whole walk she complained to me about the pain in her joints. I promised to return later that week to help her with her aches and pains. The next four days I spent treating the people of Agua Salada. Over these next days, I realized that Maria's joint pains were not uncommon in the local population, and this did not surprise me as I spent my free time hiking the mountain sides learning the treacherous conditions that the local people navigated on a daily basis. It was very rewarding to put to use my 3 plus years of residency training, treating everyone from the very young to the old. It was even more rewarding to provide care for the local population in their native language. Language barriers can often create difficulty in providing care or even comfort with a medical situation. On my final day in Agua Salada, I was able to go on multiple home visits. These visits allowed me to better see and understand the living conditions in rural Honduras. I was also rewarded by helping Maria with her achy knees and shoulder. I am thankful for meeting Maria on my first evening in the rural Honduran countryside and her appreciation provided a lifetime worth of good memories. 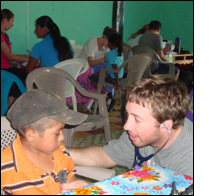 The opportunity to provide medical care in Honduras helped remind me of the fortunate lives we lead in the US, it rewarded me, the people of Agua Salada, and the surrounding villages with a multitude of reasons to be thankful.